Alcohol ink is a highly pigmented and quick drying medium applied by pouring, brushing or stamping on a non-porous surface. The vibrant colors of this ink intermingle creating unique textural effects, most often leading to unexpected results. 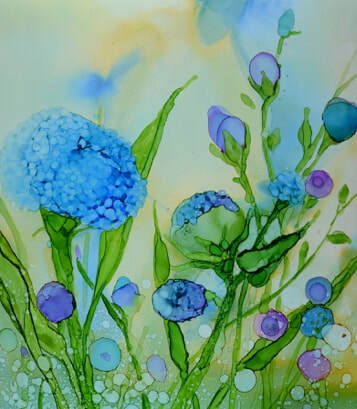 This five-hour workshop (with a break for lunch) will begin with an introduction to alcohol ink as a painting medium and a demonstration in techniques of pouring, brushing and creating textures with inks. The remaining time will be used for personal exploration with time to complete many paintings on Yupo. After the lunch break, more advanced techniques will be demonstrated and explored. The workshop will end with a critique allowing participants to share their paintings and to discuss what they have discovered. All materials will be included. * It would be advisable to bring a paint shirt or apron to protect clothing. Protective gloves will be provided. Mary Wojciechowski, a retired visual arts teacher, received her BFA degree from the University of Connecticut. She is a signature member of the Rhode Island Watercolor Society, a juried artist in the Cape Cod Art Association and holds memberships in the Attleboro Arts Museum, Collective Marks and the Monotype Guild of New England. Mary’s art has consistently been juried into exhibitions both local and regional and has won awards. She now teaches workshops in alcohol ink painting and is currently represented by Gallery 31, Orleans, MA. And True Grit Art Gallery, Middleboro, MA. "Working with alcohol inks has become a natural progression from my earlier painting. For more than thirty years, I have been a watercolorist, painting primarily in a representational style. My introduction to Yupo as an alternative to traditional watercolor paper propelled me to paint with watercolors more expressively and intuitively. The more recent discovery of alcohol ink on Yupo has expanded upon that. I have found the quick and constant problem solving throughout the process to be exciting in a way that no other medium has previously and that this explorative approach has carried over significantly to my other painting endeavors."